I still remember the day in March 1981 that Bob Bradley told me not to print the football schedule cards just yet. Villanova, who had played Clemson three years earlier with a guy named Howie Long leading its defense, had decided to drop football. The Wildcats were scheduled to come to Clemson on September 26 for the third game of the season. Now just six months prior to the season, we had an opening. What a nightmare for athletic director Bill McLellan. How do you find an opponent in such a short period of time when teams already had their schedules set? The first thing McLellan did was to call the other schools who were scheduled to play Villanova. Villanova was playing a lot of schools on the East coast that played football as something to do in the fall until their basketball season began. Just imagine the reaction to McLellan’s phone calls from those athletic directors. All 10 Villanova opponents declined. As a result, McLellan began negotiating with local schools that are now at the FCS level. (They would be called Division I-AA starting in 1982 and are now in the Football Championship Subdivision). But even the Furmans and Chattanoogas of the world did not want to disrupt their schedule at such a late date. McLellan then called Wofford, who at the time was an NAIA school, a notch below Division I-AA. Wofford was coming off a solid 1980 season that resulted in a 7-2-2 record. McLellan made the Terriers an offer they could not refuse, an offer that would balance their football budget for the year. And that is how the Wofford game of Sept. 5, 1981 came about. Today is the 34-year anniversary of that game, a contest that began Clemson’s magical run to the national title. Wofford ran an offense in 1981 that is similar to what it does today. It was called the “Wingbone” and featured an option offense that was designed to frustrate opposing defenses with late pitches by the quarterback. The Tigers had finished with a 6-5 record in 1980 and did not go to a bowl game. However, there was some momentum gained from a season-ending 27-6 win over No. 14 South Carolina that featured Heisman Trophy winner George Rogers. Clemson returned all 11 starters on offense, the only season that has occurred in school history. The defense had six returning starters, including two future College Football Hall of Famers in linebacker Jeff Davis and safety Terry Kinard. With what we know now, it is amazing to watch the first quarter of this game. Wofford took the opening kickoff and marched from its own 20 to the Tigers’ seven, where Don Hairston kicked a 24-yard field goal to give the Terriers a 3-0 lead. The Terriers controlled the ball for 13 plays, including 12 plays on the ground, for the first 6:44 of the game. That would be the longest drive in terms of time of possession against Clemson all year. In fact, Wofford controlled the ball for 35 of the 60 minutes in the game, also the most by a Tiger opponent all season. The Tigers responded with a field goal of their own on the next drive. But it took a 52-yard boot by freshman Donald Igwebuike to do it. The score was tied 3-3 at the end of the first quarter. Think of the odds you could have gotten in Las Vegas against Clemson winning the national title at that point in the season. Homer Jordan connected with Perry Tuttle for an 80-yard touchdown pass at the 9:37 mark of the second quarter and Jordan added another score just five minutes later on a 14-yard scamper. With the score 17-3 and about two minutes left in the second quarter, Wofford had a chance to gain momentum back when Tim Renfrow intercepted a Jordan pass, giving the Terriers the ball at the Clemson 49. I bring that play up specifically because Renfrow is the father of current Tiger wideout and punter Hunter Renfrow. He would also record five tackles, a pass breakup and two kickoff returns for 40 yards on this afternoon. Clemson finally took control in the third quarter when Frank Magwood had an 11-yard receiving touchdown from Jordan. That was Magwood’s first career touchdown and the first receiving touchdown by someone other than Tuttle since 1978. (I am not making that up…Tuttle had all four receiving touchdowns in 1979 and all four in 1980). Jordan, Chuck McSwain and Jeff McCall all added second-half touchdowns and Clemson won by a score of 45-10 in front of a crowd of 59,313 fans (there was no North upper deck yet). 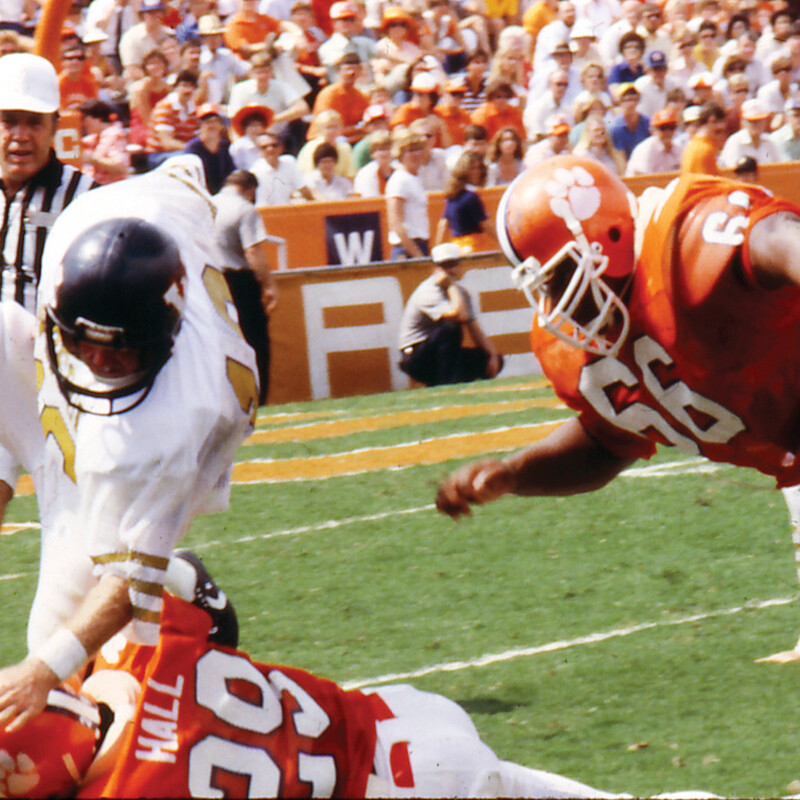 How good was the Clemson defense in 1981? Wofford scored a touchdown at the 4:36 mark of the fourth quarter, and that would be the last touchdown scored against the Tiger defense until October 17. Wofford finished the game with 165 rushing yards. Only Nebraska would have more against the Clemson defense all year. As stated above, the Terriers controlled the clock for 35 minutes and won the turnover margin, quite an accomplishment against a Tiger defense that forced 41 turnovers in 12 games, still a school record. One of my lasting memories of this day was the play of first-year freshman defensive lineman William Perry. At 305 pounds, he was considered a freak of nature in 1981. No one at 300 pounds could run like him. But early in the game, he chased down a Wofford running back on the sidelines, much to the cheers of the Clemson fans in attendance. Perry was credited with seven tackles in his first game as a Tiger in just 28 snaps. Head coach Danny Ford was impressed with Wofford on this sunny and 83-degree day. It was a solid win for the Tigers, but the national media was still not impressed. When the rankings came out three days later, Clemson was still unranked and did not receive a single vote in either the AP or UPI polls. That would change rather dramatically in the coming weeks.